Trapped key interlocking ensures safe operation of equipment and machinery by utilising locks and keys to create sequential control. Safe access is enabled through the transfer of keys that are either trapped or released in a safe sequence. Eg: a key can be used to the isolate power; this same key is then released and can then be used to gain access through a gate or door to a high risk area by inserting it in to an access lock. The key will then remain trapped until the gate or door is closed. 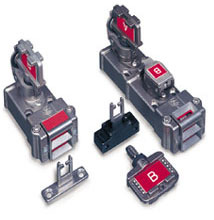 Rotary key switches are used for electrical isolation of machinery to enable safe access. Once the power has been turned off, the key can then be withdrawn and used in the next sequence of operation such as unlocking an access hatch or allowing valves to be operated. The rotary key switch can either be mounted in a panel or purchased in an IP65 enclosure. The solenoid release unit is used for electrical isolation of a machine's power to enable safe access. It only allows the trapped key to be removed once a signal is given to its internal locking mechanism, and after power has been turned off to ensure a safe condition. The key is rotated 90° and then removed which changes the state of the unit's contacts. The key can then be used in the next sequence of the operation. The electronic timed-delay is a failsafe timer and/or motion sensing solenoid locking key unit. Certain operations require an elapsed time before entry to, or removal of materials. These delayed times should be adhered to for safety or correct operating procedures. The electronic timed delay unit provides an ideal solution by trapping the key within the unit for a preset time after a stop signal has been made. When this time has elapsed the previously trapped key can be withdrawn and used in the next sequence of operation. The switchgear adaptor is used to interlock preparatory switchgear applications or other host equipment such as spool valves. Power is isolated and locked off when the key is rotated and removed. The key can then be used in the next sequence of operation. 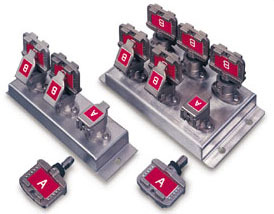 The key exchange unit is used in an interlocking sequence to link together other devices in the Prosafe range and caters to more complex operating sequences. The operating principle is such that no secondary keys can be removed from the unit until all primary keys have been inserted, rotated and trapped. The primary keys remain trapped until all secondary keys have been re-inserted, rotated and trapped. 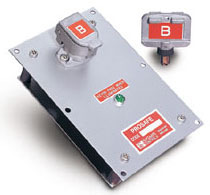 Bolt interlocks are manufactured in 316L stainless steel to provide a rugged, industrial grade method of locking off isolators or grounding units and interlocking guard doors. One advantage of the bolt interlocks is that there is no need to run power to the guard door. Power is disconnected by a trapped key on a control panel or by a Prosafe RKS type unit, and the key is then hand-carried to the gate by the operator. - The single key bolt interlock is used to lock on or off host electrical equipment such as large isolators or grounding units and as an interlock on sliding gates or hatches where part body access only is required. If two keys are needed for partial body access, select the dual bolt interlock (DBL) with both keys trapped. - Dual key bolt interlock is similar to the single key version but has a secondary key to allow ‘2 key in’ or ‘key exchange’ conditions. The key exchange version may be used where whole body access is required, as the secondary key can be used as a personnel key. Access interlocks are manufactured in 316L stainless steel to provide a rugged, industrial grade method of interlocking guard doors. 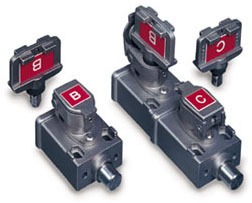 They are actuated by either a lever or a rod which is connected to a chain. One advantage of the access interlocks is that there is no need to run power wires to the gate. Power is disconnected by a trapped key on a control panel or by a Prosafe RKS type unit and the key is then hand-carried to the gate by the operator. - Single key access/chain interlock is used to interlock hatches, guards and doors where full body access is not required. - Dual key access/chain interlock is similar to the single key version but has a secondary key to allow ‘2 key in’ or ‘key exchange’ conditions. The key exchange version may be used where whole body access is required, as the secondary key can be used as a personnel key. Actuator locking arm is tolerant to misalignment ±10mm. The lever arm retracts fully into the block protecting it from damage when the guard is open. The chain option is designed to lock badly fitting guard doors or gates or to connect moveable equipment and parts. 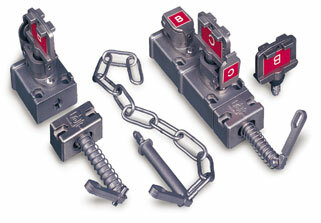 The Prosafe Slamlock combines the features of trapped keys with tongue actuated interlocks. When the actuator is inserted into the interlock (guard closed), the trapped key can be rotated and removed. With the key free the actuator can not be removed, thus locking the guard door closed. The trapped key must be re-inserted and rotated 90° to unlock the guard. Slamlocks are manufactured in 316L stainless steel to provide a rugged, industrial grade method of interlocking guard doors. One advantage of the slamlock is that there is no need to run power wires to the gate. Power is disconnected by a trapped key on a control panel or by a Prosafe RKS type unit and the key is then hand-carried to the gate by the operator. 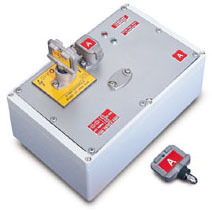 - The single key Slamlock (SSL) is used to interlock hatches, guards and doors where full body access is not required. - Dual key Slamlock (DSL) is similar to the single key version but has a secondary key to allow ‘2 key in’ or ‘key exchange’ conditions. The key exchange version may be used where whole body access is required, as the secondary key can be used as a personnel key.